I pack with only carry-on luggage whenever I fly. More important than saving me money, it saves me lost luggage. If I miss my connection and find myself unexpectedly in a hotel room for the night in Chicago, I have everything I need with me. I was able to walk down Lake Shore Drive and enjoy watching the marathon one year, rather than fret over when I’d see my luggage again. Packing with one roller bag and a small daypack makes travel so much easier. It’s simple to pull the luggage behind me when transferring planes, I can pick it up to climb up or down the stairs at the train station, and I can manage to load it in the WomanTours trailer without assistance. 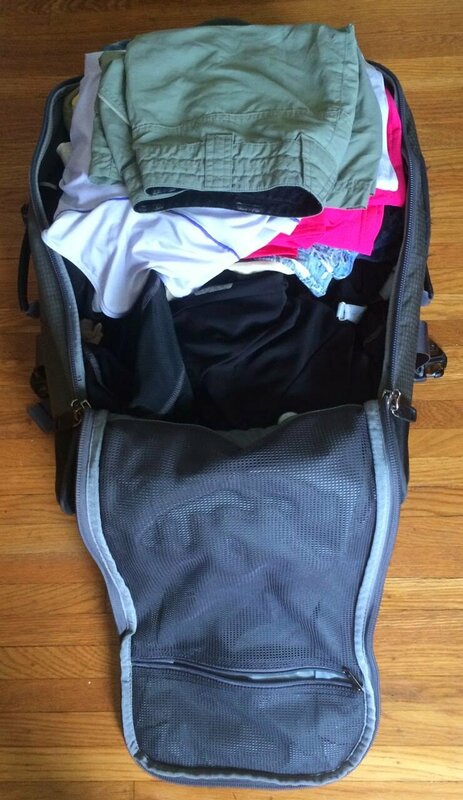 I pack the same clothes whether my trip is one week or one month long. I have a cadre of clothes that work well for travel – quick dry, wrinkle free, and dark colors that won’t show the dirt. I make slight variations for anticipated weather, such as substituting Capri pants for jeans when I go to Hawaii. But I still tend to pack the same things whether I’m going to Belgium or Bermuda. The keys are packing clothes that all go together and being willing to wash my clothes during the trip. I’ve never been a fashion queen and I think washing in the hotel bathroom’s sink is a small price to pay considering the disadvantages. Many years ago, my bag was delayed five days when I went on a bike tour in France. By the time it arrived, I wondered why I’d cared. I’d easily learned to get along with my one travel outfit and clothes borrowed from other guests. I realized I actually needed very little of what I’d packed, and now I had to worry about getting the huge bag back home. 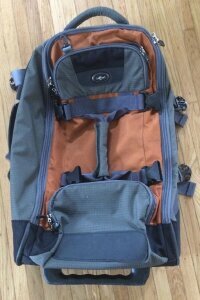 I use an Eagle Creek wheeled duffel because it’s sporty, fits within airline regulations, and has held up admirably after five years of monthly travel. 3 pairs of black bike shorts – I tried packing only two pairs but have found I need a variety of brands and padding to help prevent saddle sores. 3 jerseys – because I get bored with only 2 cycling outfits. Make sure they’re all highly visible. arm warmers – They turn any short-sleeve jersey into a long-sleeve jersey and take up no more space than a pair of socks. 3 pairs of cycling socks – I’ve tried two, but if it’s rainy or humid, they may not dry every night and I can’t stand putting on wet socks. 3 sports bras – Like the socks, I can’t risk having to wear a damp bra in the morning. long sleeve jacket - to wear over my jersey if it’s cold. tights - to wear over my shorts if it’s cold. rain jacket and pants – to also use as a windbreaker on dry but cold days. Must be waterproof, bright and highly visible. I recommend Showers Pass. long finger gloves without padding – to wear over my regular gloves if it’s cold. helmet - because nothing fits like your own helmet. All my clothes go with black or blue. I can wear any top with any bottom. Except as noted, everything is easy to hand wash and hang dry. Nothing needs an iron. jeans – these aren’t quick dry so I need to get them laundered after a week. bathing suit – it doesn’t take up much room and you never know when you will have an opportunity to swim. bag of toiletries – only travel sizes and no scissors. I pack my socks inside my shoes in the bottom of the bag. Then I pack my helmet, upside down, stuffing it full of small bike clothes such as gloves, arm warmers and sport bras. Then I cushion it by encircling it with my bike shorts, jerseys and tights. These clothes don’t wrinkle so they can be scrunched up inside the bag. 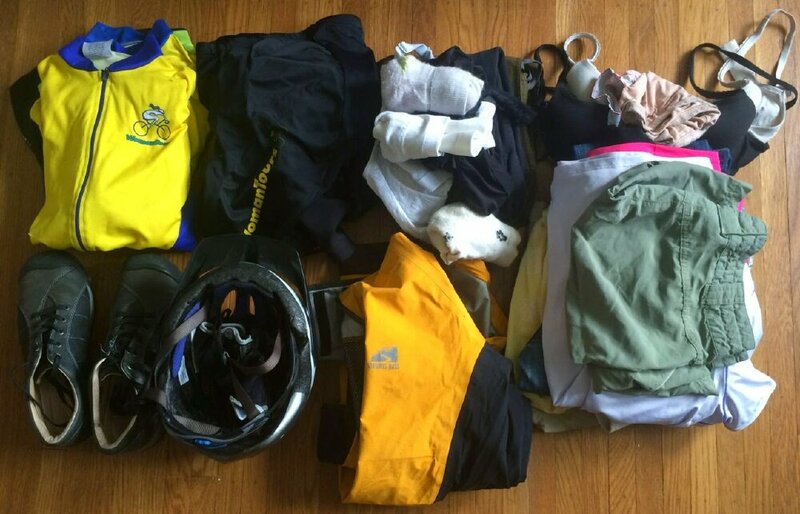 Then I lay my folded, off-the-bike clothes in a neat pile beside and on top of the helmet. If there are more things still to pack, I roll or stuff them into the sides of the luggage. I try to leave a little extra room for bringing something back with me. yoga pants – If I have two nights at the same location, I’ll hand wash these to be ready for the trip home or I’ll get them laundered. long sleeve shirt – with sleeves I can pull up if I get warm. slip-on shoes - to take off easily through security. socks – no one wants to walk barefoot through security. light jacket or sweater - with pockets to hold my ID and cell phone. scarf – to jazz up any of my packed outfits and to keep warm on drafty planes. jewelry – I wear all I’m bringing with me. light down jacket – if I am coming from or going to a cold climate. It can be packed into its own pocket when I don’t need it. iPad with loaded books to read or listen to. water bottle – I fill it after I’m past security. knitting project – knitting needles are allowed on the plane. snacks – because airline food just doesn't cut it. WomanTours catalog - because I never know who I may sit next to!